The Canon IR-C5560i provides busy office environments with their ideal multi-function device that not only meets their day-to-day demands in the present, but can also be scaled up if necessary to adapt to their changing needs. As part of the imageRUNNER ADVANCE series, the IR-C5560i can handle even complex print jobs, as well as producing fast and professional-looking documents through the copier. This system has been designed with the modern workplace in mind and can be accessed from different devices and locations using the high tech mobile and cloud solutions. The core functions of the Canon IR-C5560i are as a printer, copier and scanner, but there is also the option to include a fax machine. The standard height of this model is 950mm and it has an intuitive 10.1" colour touchscreen display unit that gives users easy access to the full range of functions. To increase the input and output capacity of the IRC5560i, additional paper trays and finishing units can be added and the model can handle a large number of media styles and sizes. This Canon printer and copier can handle paper up to A3 in size and there is a range of finishing options available to users to enable you to create professional-looking documents and presentations, including collating, stapling, hole-punching and a booklet maker. 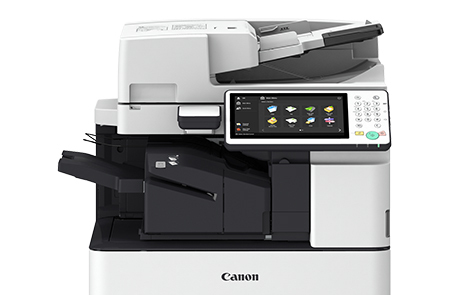 The Canon IR-C5560i can print and copy pages in both black and white and colour at speeds of up to 60 pages per minute and it has a maximum scanning speed of 160 ipm. If the full range of extras is included with the Canon IRC5560i, it can be a bulky device and will require a dedicated space. Cartridge costs can add up if this printer is used regularly, but the technology it features produces a low cost per page ratio.